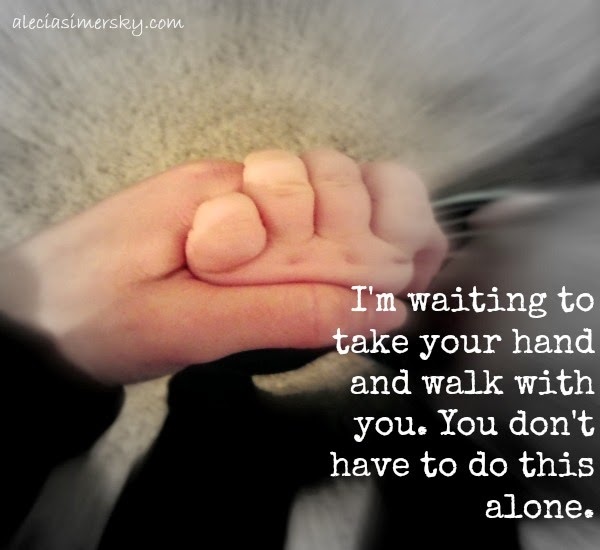 I remember when my kids were young and they wanted to hold my hand when they were unsure of their next step when they were wee-bits learning to walk. They would look up with their eyes so full of expectancy and trust, reach up with their baby soft chubby fingers and wait for my hand to grasp onto theirs. Once they felt my hand, they happily and confidently took their next step forward. The knew I would be there. They would reach up confidently without giving a second thought that maybe I wouldn't be. They knew I wouldn't let go and wouldn't let them fall. That is how I picture God with us. Waiting for us to reach up and grab hold of the waiting hand that is there when we want it. When we need it. Waiting for us to remember He is there with an outstretched hand to guide us through the unknown future. I've always been the girl that begged God for a sign, anything to let me know I was on the right path. But maybe all I've really needed to do was draw close and take the hand that was waiting to be held. That is when I sense His presence. That is when I know. It doesn't matter what the future holds or if I am on the right track. Being close to the One that holds my heart, whom has the stars numbered, and my hairs (even the gray ones) counted is the only true thing that matters in this life. I take His hand and my breathing slows. My heart fills with knowing. I am Held. And I can trust that just like I wouldn't let go of my little new walker, He won't let go of me. I am held... there is just nothing better than knowing this! Amen! Knowing that we are held is such a gift and one that God desires to give us. I love the thought of just holding His Hand and drawing strength from God in the silence. Blessings! We are so stubborn sometimes and try to go alone and we never have to! thanks for the lovely reminder! It can make all the difference in the world to have someone walking alongside us! Beautiful. Thanks, Alecia. I so often look for a sign that I'm on the right path and sometimes it's hard to know that, but I love your truth of holding onto the hand that knows what's ahead for us is the only way to go! I am held. Amen. I love this image because as a mom I know what the hand holding feels like. Thanks for linking up at #ThreeWordWednesday. You know Alecia, this is so true, a BIG huge lesson for me. When my oldest was going thru some stuff I was begging God to 'take care of Him, to guide Him, to intervene', when the Lord told me, "I can't hold His hand when you are holding his hand." I needed to let go so that Jesus was doing the hand holding, the guiding, not me anymore One of the hardest things I ever did was to let go, but things began to look different with Layton after that. So true! I always want a sign too but feel Him most in the silence. It doesn't matter what the future holds as long as I hold His hand.